Er kan met een beperkt aantal kleuren getekend worden, op dezelfde manier als een olieverf-schilder een beperkt aantal tube's verf gebruikt. They form the colormaps of indexed images. An indexed image can use a maximum of 256 different colors, but these can be any colors. 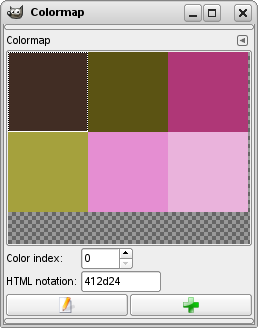 The colormap of an indexed image is called an "indexed palette" in GIMP. Actually neither of these functions fall very much into the mainstream of GIMP usage: it is possible to do rather sophisticated things in GIMP without ever dealing with palettes. Still, they are something that an advanced user should understand, and even a less advanced user may need to think about them in some situations, as for example when working with GIF files. When you install GIMP, it comes supplied with several dozen predefined palettes, and you can also create new ones. Some of the predefined palettes are commonly useful, such as the “Web” palette, which contains the set of colors considered “web safe”; many of the palettes seem to have been chosen more or less whimsically. You can access all of the available palettes using the Palettes dialog. This is also the starting point if you want to create a new palette. Double-clicking on a palette in the Palettes dialog brings up the Palette Editor, showing the colors from the palette you clicked on. You can use this to paint with the palette: clicking on a color sets GIMP's foreground to that color, as shown in the Color Area of the Toolbox. Holding down the Ctrl key while clicking, on the other hand, sets GIMP's background color to the color you click on. You can also, as the name implies, use the Palette Editor to change the colors in a palette, so long as it is a palette that you have created yourself. You cannot edit the palettes that are supplied with GIMP; however you can duplicate them and then edit the copies. 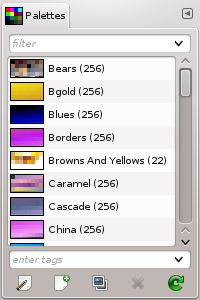 When you create palettes using the Palette Editor, they are automatically saved as soon as you exit GIMP, in the palettes folder of your personal GIMP directory. Any palette files in this directory, or in the system palettes directory created when GIMP is installed, are automatically loaded and shown in the Palettes dialog the next time you start GIMP. You can also add other folders to the palette search path using the Palette Folders page of the Preferences dialog. GIMP palettes are stored using a special file format, in files with the extension .gpl. It is a very simple format, and they are ASCII files, so if you happen to obtain palettes from another source, and would like to use them in GIMP, it probably won't be very hard to convert them: just take a look at any .gpl and you will see what to do. 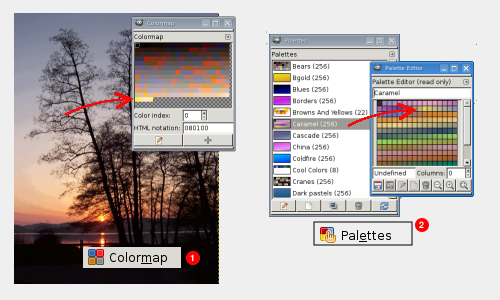 The colormap of an indexed image is shown in the Indexed Palette dialog, which should not be confused with the Palettes dialog. 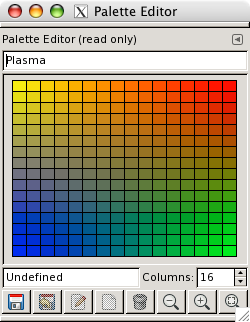 The Palettes dialog shows a list of all of the palettes available; the Colormap dialog shows the colormap of the currently active image, if it is an indexed image – otherwise it shows nothing. You can, however, create an ordinary palette from the colors in an indexed image—actually from the colors in any image. To do this, choose Import Palette from the right-click popup menu in the Palettes dialog: this pops up a dialog that gives you several options, including the option to import the palette from an image. (You can also import any of GIMP's gradients as a palette.) This possibility becomes important if you want to create a set of indexed images that all use the same set of colors. Als u een afbeelding naar geïndexeerde opmaak wilt omzetten, is het aanmaken van het geïndexeerde palet het meeste werk. Hoe dit gebeurd wordt uitvoeriger in een verder te vertalen hoofdstuk beschreven. Er zijn verschillende manieren om dit te doen warvan het gebruik van een specifiek palet uit het palet-dialoogvenster er een van is. Kort gezegd kunnen gewone paletten naar geïndexeerde omgezet worden door een RGB afbeelding naar een geïndexeerde afbeelding om te zetten. De weg terug; van een geïndexeerd palet naar een normaal palet, kan door dit palet in het palet-dialoogvenster te importeren.